Got crab? (Dungeness, that is.) Well, get cracking! When I was a kid, we ate a lot of crab. Blue crab. I’d hang out with my siblings on the docks at the Jersey shore, catching those puny crustaceans using a simple hook-and-line baited with squished-up Wonder Bread. We’d slowly reel in our catch, praying the creatures wouldn’t fall back in the drink. Then, we’d toss the crab into a bucket of seawater until they’d meet their maker — our mother — who’d throw in a big hit of Old Bay seasoning and steam them for us. Today, my siblings eat those crabs by the dozen alongside pitchers of beer at crab joints “down the shore” and at taverns throughout Philadelphia. 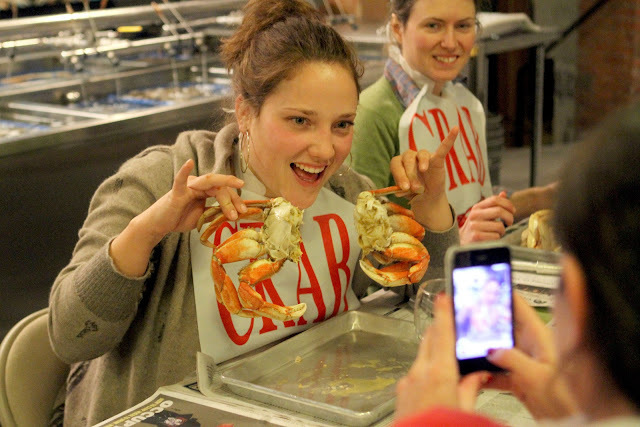 But now that I’m a hard-core Pacific Northwesterner, there’s only one crab for me: Dungeness. My boy, now 13, grew up on Puget Sound knowing the joy of dropping a crab ring over the public dock near our home in Edmonds. (In season, of course!) His bait might be a zip-tied chicken leg, a stinky salmon head or whatever “Come and get it!” goodies he can scavenge from our freezer or our fisher pals. Pulling in the prized Dungeness, he brings it home to mama, who boils his catch, cleans it, sautes the parts in Chinese black-bean sauce then pulls out the crab crackers so we can get cracking. But these days, thanks to Seattle seafood marketeer Jon Rowley, mama’s got a brand-new bag. “Put down those crab crackers!” implores Rowley. Nutcrackers? Not so sweet, he says, insisting the best way to crack fresh crab is by using a slender baton and a clean sturdy brick. Here, I got my hands on a cylindrical aluminum baton, fabricated by the folks at Taylor Shellfish Farms and sold for $20. Handy though it may be, I didn’t buy one, seeing as the stainless-steel cocktail muddler I’ve got at home does the job just as well. Ditto for the flat side of my meat-tenderizing mallet. A wooden rolling pin works, too — so long as you whack gently but firmly. No brick? Hello, Home Depot! The method behind this messy-good madness calls for a lot of newspaper (used in lieu of a tablecloth) and a roll of paper towels (trust me, you’ll need them). Rimmed baking-sheets come in handy for catching shells and the juicy bits. Whether you’ve cooked and cleaned the crab yourself or left the removal of the carapace, gills and the guts to your fishmonger, you’ll need to break the crab’s body in half, forming two sections with legs attached. To do so, simply bend the body toward you. 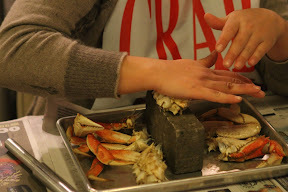 Remove the legs and claws, carefully holding onto the segmented body part closest to the leg joint in an effort to keep the body “whole.” Once the body is free of its crawlers, place it on the brick and using the palm of your hand, gently press until you hear (and feel) the cartilage crack, loosening the sectioned crabmeat for easy eating. Next, tackle the claws. Twist and remove the smaller, mobile pincer, position the big claw on its broad side and smack it with your tool (gently, gently). Crack the knuckle and the third claw segment. Keep in mind while you’re cracking that the mission is to get as much of the crabmeat segments out intact as possible. The trick with the brick, says Rowley, is meant to elevate each leg, putting it in a natural position, as if it were crawling. “The leg wants to bend,” and what you want to do is let it, swiftly and gently whacking the upright edge of each segment, the largest first. So, have you got crab-cracking tips? Cooking tips? Feel free to share.